What's On Your Workdesk 395 ..the 'really...is it Wednesday?' one.. I can hardly believe it myself gentle Desker. Wednesday already, and Christmas has been and gone. The magic of the Season is still swirling around though, so please enjoy some more as the new year approaches. The thing about my desk is...well, that canvas I was working on. I still am. Ive done other things as you can see. I covered some spoons in chocolate, paired each one with a scoop of marshmallow and a sachet of hot chocolate and put them in a little baggie as 'gifts' for the staff at my Mama's care home. The best bit about this sort of giving is the big bowl of 'lickers' left over. You can just see it before I lost control and helped myself. By the finger full. So much easier than a spoon, don't you find? It's fair to say that the food and drink of the last 4 days has made me a solid. You don't have to confess to anything, but it would be nice to see what delights covered your desks or work surfaces over the hols. Link here with WOYWW in your title. Please don't feel obliged to feed me when I visit, Alka Seltzer would probably be more appropriate. This large piggy wishes you a happy new year! However you spend this weekend, I hope it makes you happy. Tell them that you love 'em, friends, that's the key to all of this. It doesn't really matter at this stage does it - if it gets done, brilliant. If it doesn't, well, we're all still breathing, right? Under that bag is a couple of gold coloured walnuts. Sprayed about ten years ago by my Mama...they are there while I decide whether they need a place in the decorations box or the bin. Back right is the yawning opening of a bag of chocolate buttons. Obviously, they've all gone now. And my phone, waiting to be charged. Stupid really as the charger cable is at front left, waiting. Now then gentle Desker, if I don't see you back here before next week, know that I wish you a safe, warm and need-for-nothing Christmas. I'm absolutely sure that whatever your faith, we all feel that this holiday is the one that can really unite the world - let it be with love. Joint the link fest if you've time - put WOYWW in your blog post title, show us your work space - for a lot of you it may be a kitchen at this stage - and link here, it will be lovely to come and visit. There's still too much on my workdesk, but at least it looks vaguely seasonal. Things are definitely looking 'dumped' aren't they. I was working on the miserable looking dog card. Then I had to go shopping and abandoned ship without tidying..obviously. 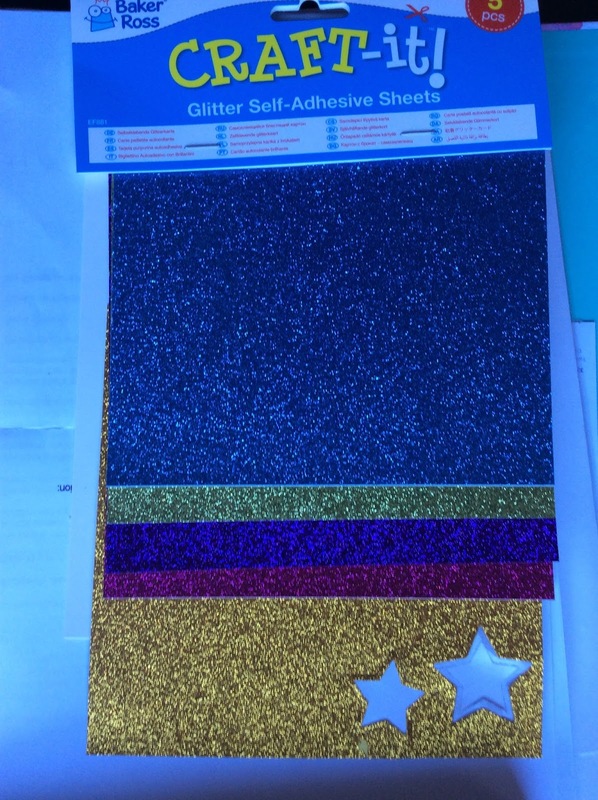 In fact, I haven't tidied properly from whatever was before the dog card - the block with the glitter glues in tells me that. The little jigsaw is about ATC sized and a die that I had to buy. That wired gold ribbon is still there too...I have used it this week - because it was there. I'll show you when I've dug out that pile on the right! Show us your festive workspaces then, we all need the strength to keep going at this stage! Put WOYWW in your blog title and link here. Thank you very much indeed. Actually, gentle reader, this is about Brussels Sprouts and Princesses. OK, not real Brussels Sprouts, and the Princesses in question are the girls that I scrapbook with. See, we do a secret Santa for Christmas and of course, we make each other beautiful cards to go with the gifts. Except I don't. I can't remember which year it was precisely, but I was very sick of making cards and so I made each of the gals a small gift that included a tag. The tag says what a card would say, right? Well, this year, Baker Ross sent me a pack of round craft baubles to play with. I did some research. (I looked at a lot of baubles on a lot of trees in some lovely shops.) I decided that I would go sophisticated. Paint the baubles with a lovely deep rich green, maybe add some gold mica, wrap ribbon around and top each one with a lovely wired ribbon rosette. Sounds terrific doesn't it? Well of course it does. And of course, it didn't happen! I found myself painting dictionary pages with a green squirty paint (from the stash of no-longer-sprays that I specialise in owning). Then I ripped the pages up and used PVA to adhere them to the baubles. Takes a bit of patience coz of drying time (yawn), and for some, it's a bit messy. Ask me how I know. On the plus side, once it's dry, PVA is easy and fun to peel off your hands! Suddenly I'm not stressing about perfectly formed rosettes. I'm ripping half moon shapes from the painted pages and layering them onto the baubles as if totally inspired. It was fun! I used them as tags on the little treats I gave the girls. 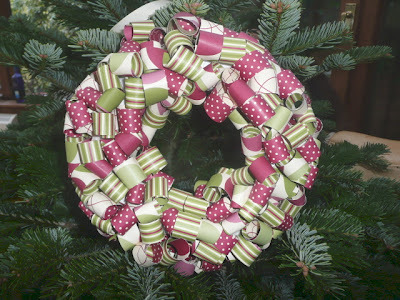 Because they are loyal friends and extremely good crafters, they recognised them as paper Brussels sprouts. Actually, the PVA glue was a great choice too...it dries rock 'ard, so these are some of the strongest sprouts. It means that the gals will have to hang them on their trees for decades to come, in case I pop round to check! Whoa! I've managed to impress myself with the amount of stuff that's on my desk. space, so that'll have to go, if little else! Share your Christmas chaos will you? No one can make this feel or look better by comparison, but it helps to read that the detrimental effect of the season on a workspace isn't exclusively mine! I showed this to Jan earlier in the week to get her reaction as to whether it would be a good project to brag blog about making for Baker Ross. She laughed so hard when I told her how I had reached this magical outcome, that I felt it only fair to share so that you can learn from my experience. 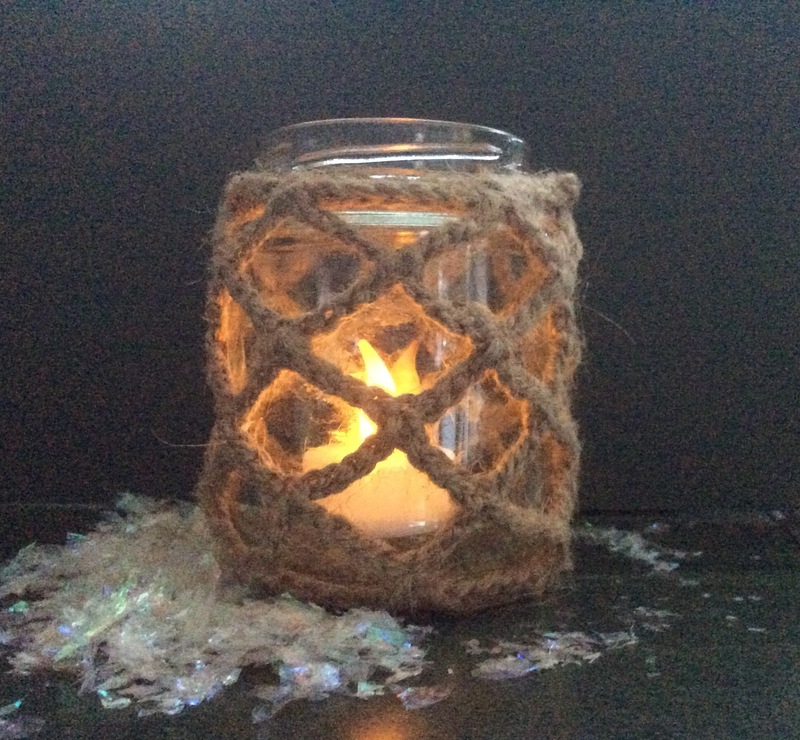 See, what you do is crochet a chain that will fit tightly around the neck of the jar. Slip stitch it together and singe crochet around again. Then, work a chain of a length that makes sense to the proportion of diamond you want....in this case it was 8 stitches. And then slip stitch it into every 6th space on the collar. Then go around repeating, making the slip stitch into the previous chain, at about the 5th position. You can tell can't you, that I didn't follow any instructions, or write down what I was doing. What you can't tell is that I found it very much easier to do it with the jar in position. What you can't tell is that when I had smugly cast off and checked it was even and looked OK, I couldn't get the collar over the neck of the jar. Stuck tight. This jar cover is not coming off. Ha! 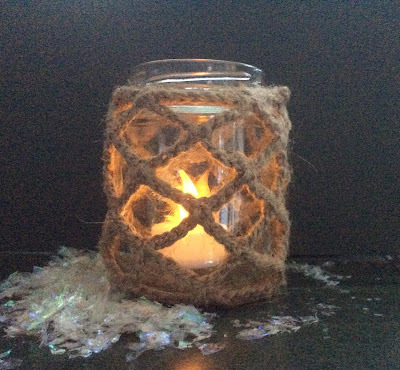 Quite funny that she crocheted a jar into its cover. idea to sit atop the piano. Indeed my dears, and here endeth the lesson. I know, Bark stars? Well of course, there's a bit of a story. I'm in the pocket of promoters at Baker Ross and they send me stuff to play with and show you. And rather inevitably, the latest box of goodies has had a Christmas theme to it. A 'Naturals' theme actually. I've assumed Christmas by the inclusion of the bark stars. See. Ask me, I can manipulate anything to mean something easier for me. Bark Stars. I didn't make them up! So of course, my first thought is for a card. 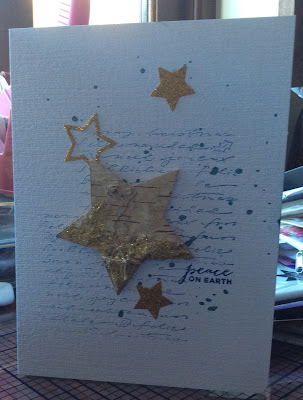 A single star just needed a teeny bit of gold glitter as an embellishment and then I was off....a stamped background because I could (old Hero Arts) and some blobs of spray ink that no longer sprays. I used a textured white pre-folded card for this one, but have in mind to try it in/with/on other colours. I've always been a bit of a stickler for 'gold goes with cream' and 'silver goes with white', so now I've mixed it up a bit, I need a short lie down. 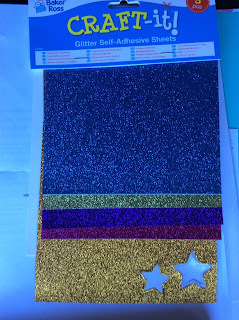 The additional stars were die cut from the self adhesive glitter paper. 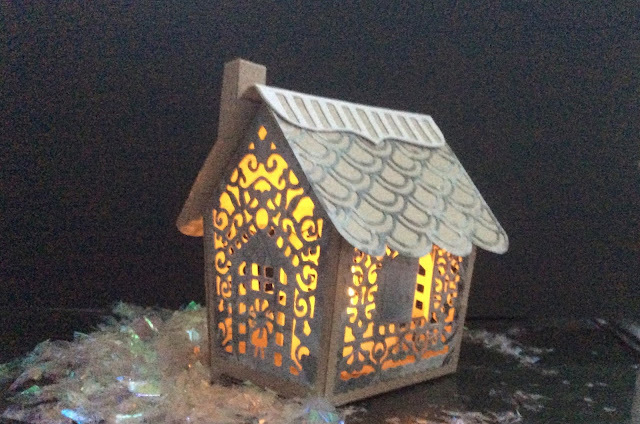 Nice huh...impressed to be honest, that it would cut - lots of plastic coated papers don't like to be die cut. I'm getting in something of a panic about cards and the quantity I need compared to how many I've made, so versions of this will crop up shortly! Taken late Tuesday afternoon, this picture is pretty lacking in light, but it had been a really beautiful and clear, cold day. You can see space on the desk, which is the sign of a bit of tidying between works, and a couple of finished cards on the ipad stand - more of those as the month unfolds. The pile on the right in the foreground is actually part of December's birthday gifts to be given, so in a way, the reflection on the packaging is a good thing! At back left is a box containing more of the bark stars that you see on the white card. And a roll of hessian behind that, currently awaiting a moment of inspiration. Ho Ho Ho she chuckles, ironically! Share your workspace with us will you? Put WOYWW in your blog post title and link it here for ease of visiting. Many recent posts on many great blogs will explain why WOYWW is such a nice thing to do! So the WOYWW Crop came and went. *Pouf* - just like that. It was a lovely day, we met new people, who I hope, didn't feel new at all. We met erm, old people. I mean, we were once all strangers and now, because we flash our desks at each other once a week or every so often, we're friends. Stolen from Jan's blog, because I didn't take a single picture. Not one. There is a presumption of friendship when we meet - because we know something about each other already. And then, if there is ice still to be broken, the cake does the trick. My word the food is definitely a friend factor! Doug (beardy boy looking chap at back right) did the lion's share of everything. Putting out tables, clearing tables, serving drinks, washing up...you name the job, he was in like Flynn. So we're changing that saying to the non-rhyming 'in like Doug' from now on. That is not to say he was totally solo...all husbands/partners who came to the Crop were brilliant at the clearing up and washing up part; we truly love you boys. But the biggest shout out is for Jan. A month before she moves house and in the beginning of the clutches of Christmas and all the commitments that she has through Band and School, she motivated, instructed, reminded, cooked, baked, provided. As she always has for these Crops. Way back, the first one was entirely due to her encouraging me that some folk may like to meet in person and that it wouldn't be awful. Couldn't do it without her, and if you've been to a WOYWW Crop, you'll doubtless agree. She and I are continually blown away by the distances that others have travelled for these meetings; and so now it's our turn to do the distances. Jan is leaving me moving to Wales, so WOYWW Crops like this won't happen again. I can hardly invite her to stay and then ask her to cater for 20 odd people can I? So, if you fancy a WOYWW Crop in your area, find a venue...a hall with a kitchen (drink making facilities as minimum, we can all bring packed lunches if necessary) Loos and decent parking are the other must-haves. It's actually very little work on the day because hey - Doug! No seriously, we all muck in and it works beautifully. Let's get this show on the road! It's not looking too messy is it?! And certainly isn't telling the story of the difficulty I'm causing myself by not having any decent ideas! That plastic box at left is the gems section of my stash. Of course I rootled through it to find the holly berries you can just see on the card that still isn't finished. Meanwhile, an explanation of the stunning daylight is due to you. Took this picture on the hoof yesterday, just after lunch when Mr Dunnit announced that Wednesday was to be a date day. I know, you're all thinking how sweet and considerate he is. Date DAY is actually a day where I get to ride with him in the big white van to help out with deliveries to sites and 'run interference' at jobs where there is fitting to be done. My talking skills quite often help in these situations - they prevent the home owner standing in the room telling Mr Dunnit how to do his job, or explaining that he would do the job himself only he's incredibly busy. You get it. HUGELY looking forward to seeing any of you that can come to the Crop on Saturday, my word it's been ages! Meanwhile, entertain us will you, please post your inspiring and enabling seasonal desk pictures for us to ogle and discuss. It's important for those of us looking for inspiration on a permanent basis! Well, it may look staged, but it honestly isn't. I said to Darnell on Facebook the other day that I was planning Christmas cards by tidying my desk and then studiously avoiding it. True. But, for good reason..I'm trying to decide between serious holly or not serious holly. I think. I may not use either of them because soon, I'll have gone off the idea of holly. You can see some 12 x 12 (from Fiona, a desker and Stampin Up! gal), which is for my December calendar...I'm excited to say that I've got 2 things going on in December that equate to a social life, so that justifies the making of the calendar! There's the inevitable glasses, some small scissors - I know not why - and the big ugly hole punch and calculator are there because I used the desk to do the October month end on Monday. Yes it was late. No, I don't care. The blankie in the basket at right is actually a wad of packing tissue for no good reason, and on top of that is a pretty ring binder. I manage my sweet Mama's affairs and figure she deserves everything to look as pretty as it can. Also, in case you didn't know, I'm a sucker for nice stationery. So that's not terribly inspiring, but I am at least thinking seasonally. A start! Share do, am sure you're way head of me in terms of planning and prep for thanksgiving and Christmas. Put WOYWW in your blog post title and link here. And please...don't hold my rubbish visiting statistics against WOYWW generally, I really have been ridiculously enveloped in real life stuff, but will do better as the weeks progress, honest! Y'all know that crafting is a therapy. Well, I have always been an advocate of crafting in company if you can. Doubles the therapeutic effect. I'm firmly a believer in a workshop or two; I mean, where else are you going to try the next technique/tool/products without having to buy them and then do your own learning! That alone makes a workshop worthwhile, but the company and the gossip makes the idea of occasional crafting company irresistible. Which is why the WOYWW Crop came about. To meet the people who take the photos and sit at those desks of inspiration. And to talk and swap ideas. Oh yeah, and to eat. So the Crop that is upcoming on the 26th will be all of that. I know the date isn't ideal for a lot of you - we're blaming the neuro-surgery team at Southampton for that - I don't think we really expected that I would be well enough for any of this sort of malarkey just yet. Bonus then! (well, for me.) Here's another bonus...the date has fallen between the monumental commitments that Lunch Lady Jan has been making. And so she says she will cook lunch. Hallelujah and all that, how lovely! Times, location details etc, will be on the Crop page that you can access at the top of the blog. Strange angle to see the mess from! The table is, as you know, on castors in front of a barn door. Access has been required to the garden for building purposes. And so, my desk has been moved. I was working at my desk yesterday morning (despite appearances, I had some space and was writing letters). Without warning, Mr Dunnit came home with machinery that he'd hired for the day. The machinery was to lift a ridiculously heavy steel lintel into place. To hold up the side of my house. We're extending, see, now that there's just the two of us at home. So of course, I had to drop everything, drape dust sheets and move furniture. Again. And because I didn't think it would be too bad this time, I didn't throw an old sheet/curtain/bedspread over the desk. Mistake. It looks as if someone emptied a tin of gritty talcum all over the desk. Argh. But, hey. The lintel is in place. The lifting machine has been returned without excess to pay. My house is still standing. When I've dusted them off, I'll show you the cards I made. Yep, I really did. Share your desk sights and stories with us please....put WOYWW in your blog post title and link it here. Fab. Oh Desker, Reader, can you believe your eyes? Rub them again, it will not change the picture. Card making. CHRISTMAS card making. Slow, sometimes painful, but it is happening. And none so smug as me, I can tell you! There's glue and glittery snow. There's Christmas trees. There's a bauble image (to be discarded, I think). There's a stag. Far right there's an almost full mug of coffee. You can see that my modus operandi is unchanged. Get it all out, look at it. Start work and find there's no room and everything is in the way. Hey ho. You can see the new chair too...it has arms. I feel very posh. It's actually too low, but I'll overcome that soon. The addition of a cushion would do it, but it turns out that I don't sit still enough and it gets all bunched up and irritable. Oh wait, the irritable bit - that may be me. So, come on you lot whether you're still loving the autumn and not thinking about Christmas yet, show us how your desk is reflecting your seasonal thoughts. Good ideas for gifts and cards always welcome! Shocking isn't it, how fast that week went by. For me it's because by Wednesday I was already planning Friday and my weekend of Crop Retreat. And I didn't get home till Monday lunchtime, which is as good a chunk of the week a I usually take to blog and do things to blog about! So my desk today, der Desker, is a transfer to the floor. Where my weekend waits to be unpacked and transferred back to my desk. This will be later this morning when I get sick of tripping over stuff. I should add that this is not all I took. There's a rolling tote full of stuff too, I'm not exactly sure where that is at the moment. I suspect it was moved by Mr Dunnit to make some room for real work! And of course I took a weekend bag filled with too many clothes, I was equipped for all weathers. I didn't take any will power though, and have had an incredibly indulgent weekend. And so to pay for that...a fight with the newly washed jeans tomorrow, I bet! I'll show you the fruits of my labours just as soon as I unpack 'em. Meanwhile, please show me yours. Post on your blog, with WOYWW in your title and link here for maximum exposure to those who love to see what you're doing! I'm in shock myself gentle Desker, this is really looking out of control! See, I've had a LOAD of drawers and boxes to clear from my Mama's collection. It all got a bit desperate yesterday when I had to try and do more than one thing at once, and so inevitably, I used my desk to just dump the bits I intend to keep. I see my after lunch drink can which is very lazy. It's a blood orange fizzy, I'm really enjoying them at the mo. The empty box at right was to be saved because it's a useful size. But there's quite a lot to find room for now, so I suspect it will be a gonner. And then I'll need it, huh! On the ipad stand is my first serious Christmas card of the year. I was hoping to be quite prolific about them this week, but time is against me. For now. Once this lot is tidied I'm going to be making some more. Let's see your tidy and ordered work spaces then, you know you want to set the example! Put WOYWW in your blog title and link the post here, as usual. Great! This brass standard lamp was bought by my parents during their tour in Hong Kong, between 1964 and 1967. It's been used in all of the houses they've lived in ever since. It has been the light under which I read countless books, it was probably part of the scenery as I learned to read. We girls (there were four of us) would, now and then, be required to clean it. Either as an attempt by my father to make us help and learn the value of chores, or as punishment for some misdemeanour or other. Cleaning it involved a tin of Brasso, a cloth to apply it and another soft cloth to rub it off and burnish the clean metal. It really was a chore. It took ages. My father used to get cross at the time it took us, and one of the expressions I heard more than once was 'you've only got two speeds - dead slow and stop'. It wasn't helpful. Probably more infuriating for him because of all the delaying and sighing that went into us doing any chore, because he was the overseer. As an adult, I get it and ask myself - punishment for whom?! This weekend, the lamp stand came to live at my house. It's caused no end of shifting and changing and trying of existing lampshades. And, it needed cleaning. Well, Mr Dunnit was busy knocking holes in the plaster and brick work in preparation for building work. I felt that sitting at my desk and having a bit of craft time was probably an inappropriate way to spend the afternoon whilst he was working so hard on my future comfort. I faffed about and took some photos, I tidied another room, I swept the kitchen floor. And finally realised that I might as well just get the Brasso out and clean the damn lamp. So I did. It took less than twenty minutes. Wilb would have dined out for another lifetime on all the learned lessons in that! Well, gentle Desker, you've seen all this before. And you've read all of my excuses. Well everybody, I'm over it. I've done the convalescing and the 'can't be bothereds' and I've done the lack of mojo. Now I'm at that point where you get ideas for cards because you're too busy to actually make them - you know that, right? So that's what I'm working towards...see one arm of my glasses behind the sellotape dispenser....is that to make them easier to find or an inanimate plea to be picked from all the rubbish? I've been wrapping and posting stuff see, so my desk has been my toy post office. Good enough, for now! Show and tell your workspaces will you, you are a fascinating contributor. The beauty on my desk was a birthday gift from Jan and I've decided I need to do something to the frame. I've only had it hanging for two years, so this is a bit of a rush decision. I'm probably going to just give it a wax polish, so a major alteration isn't on the cards. And it's on my desk because it's a thing I plan to do this very day. The corner of the box at left is filled with some more wood mounted stamps from my Mum's collection - waiting to be photographed and put up for sale. The wrapping paper is there because I have several birthday presents to wrap....it may look a mess, but it's all a sensible mess! The pink thing underneath the picture is a file, filled with print outs of card ideas that my mum has collected. I thought it would be nice to browse her library of cuttings and clippings before just consigning them to the bin - it might prove really inspiring! And talking of inspiring...drag yourselves away from the glory of autumn for a mo will you - make a nice blog post about what's on your work desk, and link it here, we do want to see. Yesterday and today have been the most beautiful autumnal days. A hint of chill, for sure, but glorious sunshine Because this is Britain, there were people walking around the shops in t shirts and sundresses. I'm wearing a sweatshirt and jeans. The concession to the glory of the sunshine is a pair of sunglasses and no coat. I'm definitely middle aged. This weather report is brought to you by way of an explanation for my thoughtfulness. See, I was walking through the village, getting some exercise (and a loaf of bread) and enjoying the sunshine. Walking alone gives you thinking time doesn't it. 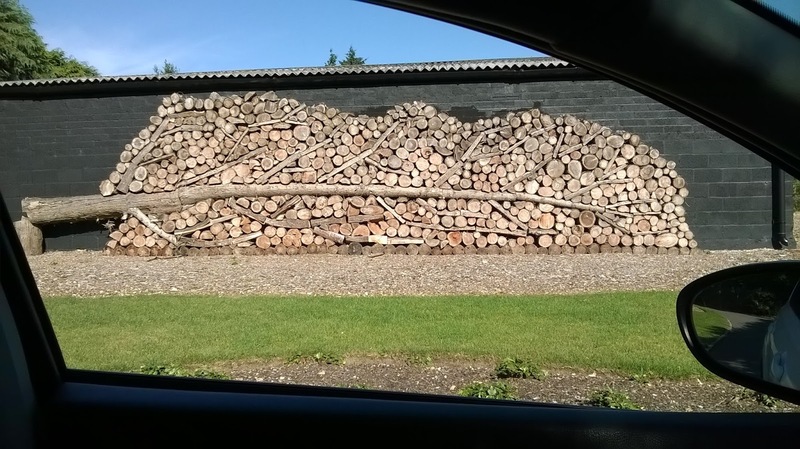 Autumnal readiness....somebody's fabulous wood store! Or, probably more accurately 'Some Things Never Change'! A very blue picture in the early morning light - but the sun will haul itself higher and the day will roll forward, sure as eggs is eggs. And the never changing part of this - you've all seen or read about my skill in preparing for a Crop. Well, here we go again. It's on Saturday. But here I am on Wednesday just gently trying to remind myself what my 'ready box' of matched-to-paper-photos is looking like. It's four months and some brain surgery since I last looked. The one thing that struck me first was that oh boy, I don't actually match papers and photos - rather I 'pair' them. No wonder I find scrapbooking so hard!! Anyway, that's the desk - it's naturally all on top of whatever was already there, but you're used to that too! Show and tell for us then will you, encourage and inspire, please! Well look at me....washing's out, desk is relatively tidy and it's good light. Oh..you can't see the washing, waving on the line. Oh well, you'll just have to take my word for it that this morning has started well. It should continue so too, I'm off to help that Jan and her important G to shift stuff from one house to another house. I'm going to be a van driver. It's been ages...! So, an aerial view of the desk, taken with no effort at all - I just held my ipad in the air; no chairs used or stunts pulled to achieve this pic. You can see the top side of the painted stone now. The first one I painted is by my flower pot on the front doorstep. I like it. And so with a spectacular lack of imagination, I'm making all the stones look similar! That's the extent of this weeks crafting; I keep talking about intentions, but there's so much that keeps me away from it. I firmly believe that you make time to do things you really want to do, so I'm obviously not quite as inspired as I want to be! Please join and show what you're doing and where you do it; it's just fun. Saturday 8th October 2016. 10am till 4pm as usual. We will of course, provide tea and coffee and more cake than you can eat. It's the law. But we (by which I mean Lunch Lady Jan,) won't be cooking your lunch. There are various and many options; you could bring your own. You could go without. You could stroll over to the 'strip' in Tidworth and buy your lunch from one of very many take-away establishments - Chinese, Indian, Fish and Chips, Kebabs, Pizza, Subway to name those that come to mind. Or you could wait for Julia to offer to go on your behalf with an order book. You get the picture. It's not exactly a grand gesture by me is it - if Jan's about to move house, she won't want to do the pre-cooking work that she usually does for us. So instead of taking up the challenge, I voted to make the location closer to essential services. Food. . Sort of number dependant, but will be no more than £10 for the day; as always, we'll collect payment from you on the day - no deposits or commitments in advance please, we are women and we have to remain flexibubble. 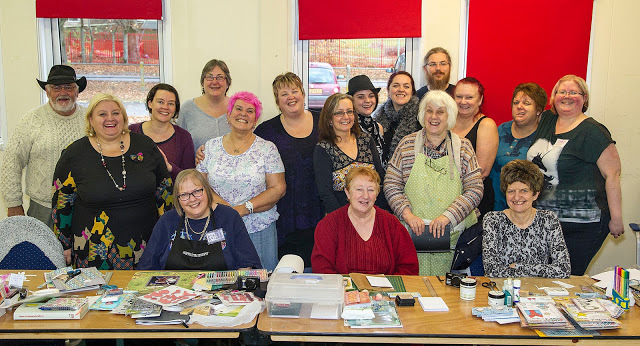 So if you'd like to spend a day eating cake and chatting with fellow crafters, bloggers and nutters, please come and join us. Jan and I love these days. They aren't particularly extra ordinary in terms of activity or location...they are extraordinary because we're friends before you even come through the door. Let me know if you wanna be there then - save Jan and I sitting on our own amongst a load of cake! Not much sign of come back crafting really. There's a bit of interest though - a bunch of beautifully stamped and cut out flowers came from Sally and therefore get to sit on the ipad stand to remind me that they are almost made cards! There's still a couple of stones - one red, totally blank apart from the red, another purple. The purple one is drying after a coat of varnish, the other side is more interesting! There's an (empty) packet of sweeties - chocolate mini eggs. Gotta be one of my favourites. Cadbury have produced them out of season and called them 'Wini Eggs' because they have a competition to win a trip to Rio for the Para Olympics. I haven't won. In front of that packet is a box of confetti - we went to a lovely wedding over the weekend. It's very unusual to be allowed to throw confetti these days, so we really chucked a lot about....and then I scrabbled around on the steps of the venue to collect some to put in the album. Like you do. The card expressing pride is for my nephew. He's a soldier now, and his Passing Out Parade is on Friday. Another occasion for a frock and some well shined shoes! Show and tell will ya, I've bored you with mine, you owe it to me! For as long as I've been able to understand speech, people have told me how like my Mother I look. My adult response has always been 'thank you' and if there's time, an explanation that I'm actually more like my younger sister than my sainted Mama. And that's all true. It's also totally true that all those clichés and sayings about being like your Mother apply to me. We could (and I stress "could" share shoes. There is a point in my memory when we did....early 1980's, we had the Marks and Spencer pointy toe high heel sling backs in every colour between us. I wore the white ones on my wedding day. Mistake that, with a hooped skirt on your wedding dress...the bloody hoop got trapped between my foot and the shoe on every step....argh. I digress. I learned from Mama that if you see a potential gift for someone, buy it, if you can afford it. Save it for the occasion. If you can't afford it, write it down in a proper not-to-be-lost notebook rather than think you'll remember it. This has really been helpful. Mostly, I am therefore reasonably prepared. With ideas, if not actual presents for birthday and Christmas times. Which is why, earlier this month, my desk was a wrapping station for Christmas gifts. Just as my Mother would have done, I used my niece's UK holiday as an opportunity to get my USA family's presents sent, carriage free, so to speak. I wonder if they open them all early, or if they're kept? I wonder if they think I'm amazing because I'm so organised. Or a bit of a nerd, or silly. No, as it's an inherited skill, they'd never be so rude. Would they? Way back in 2011, I had cause to write to Santa after Christmas, to ask him to help Mr Dunnit better interpret my clues as to the presents I would like. Well, I don't like to judge, so I'm going to say that Santa didn't get my letter. This year, chez Dunnit, we have been plotting and planning more building works. It's serious stuff, and we've worked hard in terms of budget and material choices and plans. My surgery has inevitably delayed the upheaval, but things are on the turn. Delivery of materials for this project have become quite frequent. It was my Birthday last month. When he asked if there was anything in particular I would like, I was happy to say there was not. Not even a surprise. I have no wants or needs. A couple of hours after this conversation and with a sheaf of paperwork on his lap, he asked me if I'd like some precious metal for my birthday. Now, remember the reason for my letter to Santa. I said it would be nice, but absolutely unnecessary. 'Of course it's necessary', he said 'and it would make me happy - we could think of it as a joint present'. How sweet. the length of the garage and oh, there's the mower again. Be not surprised though gentle reader, when I tell you that the steel lintel - stage one in the building process - has been delivered. In his defence, it is a precious metal - it will hold up the side of my lovely home at some point. Joint present? I guess it is. I wasn't fooled, but thought you might recognise this thought process! Well, taken yesterday mid afternoon, my desk is one of beauty. Seriously. It's bathed in sunlight. It's not piled high. It's not filthy. There's a pile of new stamps. Yep. And there's evidence of actual work having taken place. The calculator is a left over from the quarter-end VAT that I've just done for work. Yawn. The drink is a caffeine free Diet Coke. I have had the pleasure of my gorgeous American nieces staying with me, so I bought stuff like Diet Coke, bagels, you know, things they would like. Seems that now they're both in their twenties they're over cans of fizz. So I'm doing what mothers often do. Finishing up. All 12 cans! Then there's the big red stone. It's in the process of being painted, obviously, hence the painty water at right. It'll become another doorstop, outdoor ornament, you know, a 'thing' . Don't know when though, because there's new stamps to play with and suddenly, I feel quite inspired! New stuff and the agreement with Shopkeeper Gal to try the odd workshop again. Nothing like it to get me going! Share will you, let me see what your up to while I procrastinate. Leave you link here and as usual, please don't take this as an opportunity to promote product or advertise. Oh, and put the kettle on will ya - that Diet coke is out of fizz! *passes the smelling salts*....apologies if you're feeling faint at the sight of this tidied slightly more organised and actually productive desk. I think I'm finally getting a grip gentle reader, and forcing the cogs to turn will, I hope, get the ideas and inclination flowing! I think the picture is self explanatory, and considering our gloomy weather, the light in here looked pretty good at six o,clock last evening! Come on then, show and tell y'all. Well now, last week's explanation of the door to the garage being behind and opposite my desk was a classic case of too much description wasn't it! I don't have panoramic photography skills (even if I have the technology), so here is a shot of one wall of my workroom. You can see the 'office section' (computer and printer!) and my die cutting section on the worktop. At right, you can see my desk. It's on wheels you know, so that we can easily access the barn door against which it resides. At left but out of sight, therefore on the opposite wall and behind my desk, is the door to the garage! - that rounded worktop in front of the computer only extends about another 10" out of shot, see. We had a lovely the best afternoon and evening with Darnell in Salisbury last Wednesday; I know that Darnell has already blogged about it, and I know Jan will be showing a couple of pics too, so I wont repeat - but my word, if you like a chat, we really should meet! Meanwhile, divulge your summer artworks will ya - lets see those desks in the best light of the year! Well, WOYWW is back in it's original location having spent a lot of weeks being looked after by my friend and conspirator, Jan. Please hum a three cheers song for her today, it's been a monumnetal thing to take on, amongst all the other stuff she does for me. To erm, celebrate the return of at least one blog post a week to this address, I thought it would be a good idea to show you what happens when you have no desire to craft. When your mojo goes on holiday and 'can't be bothered' moves in. This is a drawing of the line. I'm so sick of the state of this room that I'm going in and I'm going to be brutal. I am. All the mess and detritus that is over exposed by bright sunshine will still be there this afternoon - I'll get to it, but first, I'm off to Salisbury with Jan to meet up with Darnell - excited! Show and tell about your workspaces will you - inspiration and tidy methods are going to be trending! One last thing - sorry to go on - we rather fancy a WOYWW Crop. October 8th. New location, details a bit later? Whaddya think? I am completely without the urge to be creative. I've been painting stones (as you can see) in an attempt to coax the 'ideas' and 'enthusiasm' sections of my brain to work together. Even the stones have been there for a few days, untouched. No idea what is planned for them at all! But I figure that playing at anything is better than doing nothing. Or worse, tidying up! Such is the way our lives move, that my lovely Jan is soon going to find being the WOYWW host a bit of a tie, so despite her undying affection for you all, WOYWW hosting will return to this address next week. That's for and from number 372. You may think she's been an excellent host and absolutely great to have stepped in and kept us all going. I think the same, and a whole lot more. Indeed, the word 'rock' springs to mind, but that might just be brain and desk word association at it's most lame! Making like a DT member! Way back before the medics rendered me lazier and less motivated than normal, I had an email convo which ended up with the arrival of some bits and pieces to use in my crafting from Create and Craft, a cable TV channel and a website: createandcraft.co.uk. I must say I was surprised by the request, and apart from the attraction of some more stash, I was quite curious as to the nature of their intended promotion. I was sent a pack of fifty various shaped edge A5 cards and a pad of printed, foiled sentiments (Hunkydory), a bag of alphabet beads, three reels of gorgeous organza ribbon and some stick on pearls. I think that selection is probably a good cross section. Anyway, with freedom to do pretty much anything, inevitably, I had blank page syndrome. Coupled with all the hours I've spent just sitting around these last few weeks, thinking about getting back to my desk,it was a bit embarrassing! When I finally did, it was so nice to sit in a different chair and take an interest! Overall these were a bit of a challenge for me, which is a good thing I know. I don't stray far from the standard C6 card size, greater mortals are brilliant at the bigger cards and so I stay safe. And then there's the patterned edges. Oh my, I'm still scared of them - I think they dictate style and genre for a card immediately. Of course they don't, but I do think they make a particularly good frame for cards featuring die cut images...you know, the old more is better thing! WOYWW is blessed to have Darnell on the roll. Founder of the NBUS principle, she encourages us to make cards employing 'never before used schtuff' and that's a challenge of genius for someone like me! We discovered by accident of chatting, that she lives in California, a stones throw from my emigrant sister. So of course we've planned to meet for ages and it hasn't happened. So finally Darnell is taking the upper hand and sorting the situation; she's coming to the UK. Better, she's set aside an afternoon an evening to spend in Salisbury with any Deskers that would like to join us. I say 'us' because I'll be there, I'm really looking forward to meeting her! It's to be 20th July, in Salisbury for tea and/or supper. You could dip in and out or stay over the few hours; if you'd like to join us, you're welcome! ..and another. I admired this so much and now.. I have it! I know there are logistics and timings to be considered, and directions and lifts and meeting places to be sorted, but that's just detail. Focus on how much fun we'll have! let me know - then we'll figure details out!